The City of Ouray, Colorado bought the area now called Box Canyon Park a long time ago. Thanks to the City of Ouray. The Park is a little jewel. Upon entering Box Canyon, you will be awed by the sound of roaring water as the force of thousands of gallons per minute ricochet off a mix of rugged crags and smoothly eroded pre-Cambrian rock, rushing eighty feet to the canyon’s floor. 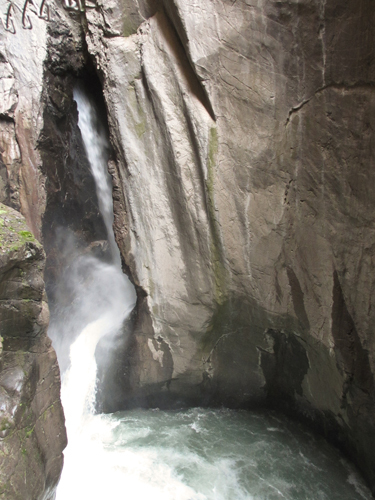 Not only is the Park a jewel, and the Black Swifts a major attraction for birders, but Ouray (pronounced “Youray”), is a lovely mountain village and worth a summer visit for its own beauty. I learned of the presence of Black Swifts at Ouray from an article in the September-October 2012 issue of Audubon Magazine, written by Alisa Opar. Anyone seeking information about the amazing Black Swift (its airspeeds can exceed 100 miles per hour, and it may remain in the air permanently except for the time spent nesting and raising young), should read that article. 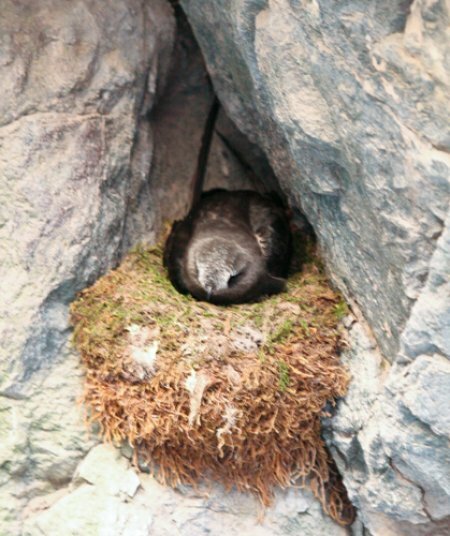 At Ouray, Sue Hirshman has dedicated 18 years of her life to recording the daily activities of the Black Swifts who nest at Box Canyon Falls. She graciously agreed to meet us at the site on June 23, to help us locate the nests, eggs and hopefully, swifts, who were just beginning their reproduction cycle. I was, to re-coin an old phrase, “blown away” by the close-up views of the nesting Black Swifts, their nests and their eggs, at unexpectedly close range. I had expected to find the Black Swifts at Ouray, but not to see them so well. 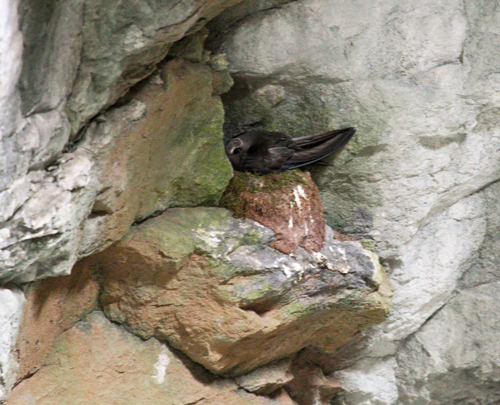 Uniquely among North American swifts, the Black Swifts lay only a single egg. 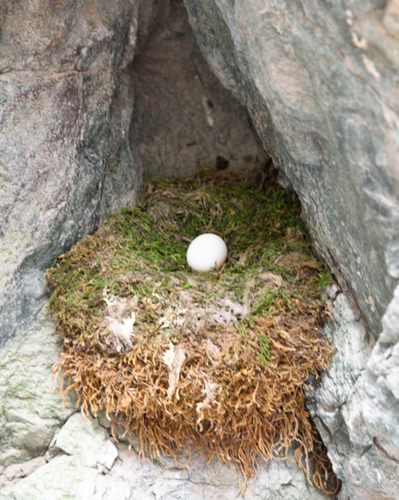 If that nest fails early, they may lay a second egg, but the long growing time (45 days) required to reach maturity may endanger late born swifts because of the arrival of cold weather in October. My North American Life List grew to 733 with the addition of the Black Swifts. That leaves only 4 more ABA code 2 birds to add to my list: Sooty Grouse, Whiskered Auklet, Mottled Petrel and McKay’s Bunting (the latter 3 probably only to be found in Alaska or its waters). I will be working on this during the balance of this year. Two of the seven ABA Code 2 birds that I have not seen in North America have been the subjects of recent changes of status under the American Ornithological classification system. Nutmeg Mannikins are not native to North America, but have been around in southern California for a long time. Last year they were recognized as a viable population and given recognition by the ABA. 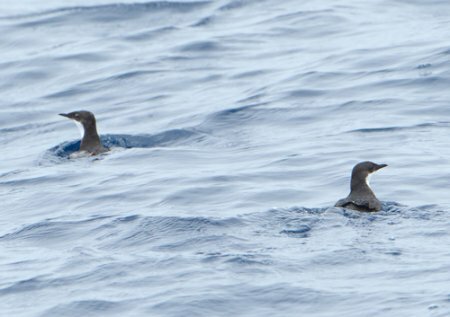 At about the same time the species known as Xantus’s Murrelet, was split into two species, Scripp’s Murrelet and Guadaloupe Murrelet. Scripp’s Murrrelet was designated as an ABA Code 2 and Guadaloupe Murrelet was designated as an ABA Code 3. Poor old John Xantus (1825-1894) thereby lost by the stroke of a keyboard one of his only two namesakes in the bird world. I wouldn’t be surprised to see the other one, Xantus’s Hummingbird, succumb to a similar fate if his reputation is not redeemed before that happens. The Nutmeg Mannikins were easy to find in Tecolote Canyon, on the north side of San Diego. In fact, there must have been at least 30 of them in the flock that flitted about the stream bed near the entrance to the Canyon. I missed them on my way in but Chris, a local birder, figured out what I was looking for and sent me back to the gate area, where I enjoyed watching the noisy flock for a half hour or so. Number 731 on my North American list and leaving 6 on my target class of Code 2 birds. At 6:30 the next morning I departed from Port Loma on the Grande with a group of about 50 birders, destined to the 30 Mile Bank over a 12 hour excursion. 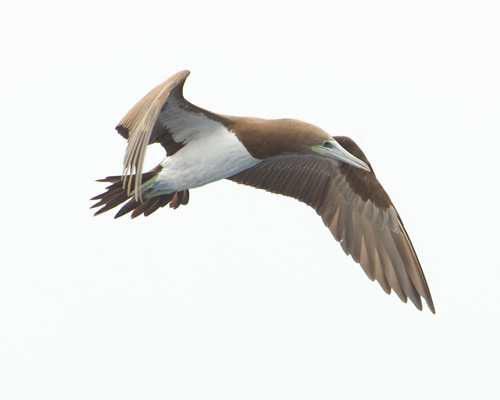 This pelagic outing, sponsored by SOCAL, is an annual event and attracts many local birders as well as a few of us from greater distances. Paul Lehman was the lead guide on the trip and did a fine job of keeping us all informed of not only the birds, but the other natural objects observed along the way. He informed me that to see Scripp’s Murrelets on this trip was far from a sure bet, because most of them had moved out of the area by the end of May. 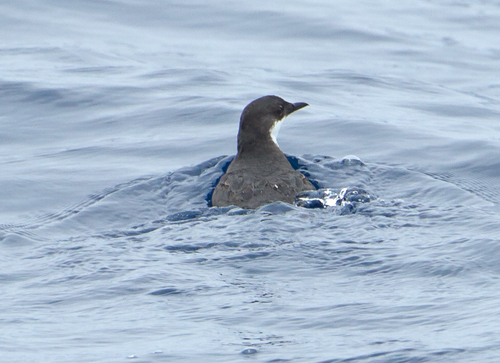 So, it was with great relief and pleasure that about mid-afternoon, 2 Scripp’s Murrelets appeared alongside our boat and gave an unusual opportunity for close-up observation and photography. Many of the folks on the boat were photographers, and one, Doug Galasko, sent me two photos of the Murrelets with permission to use them on this blog. The Scripp’s Murrelets became number 732 on my North American Life list, and reduced the number of Code 2 birds that I have yet to see to 5. I am hoping to make a clean sweep of the Code 2s within the next year. Three of them will probably mean another trip to Alaska (Whiskered Auklet and Mottled Petrel in the Aleutians and, in Nome in winter, McKay’s Buntings). The other 2, Black Swifts and Sooty Grouse remain a challenge for me but should be found somewhere in the western part of the lower 48. Doug Galasco also sent me a photo of the somewhat uncommon (in North America) Brown Booby that we saw from the Grande. The same lady who directed me to the Nutmeg Mannikins in Tecolote Canyon, also suggested that I go to the Bird and Butterfly Garden south of Imperial Beach to see the Black-throated Magpie-jays that have been seen regularly in that vicinity. These are not recognized by the ABA, as there is evidence that they are escapees from pet status and may not have established a viable reproducing wild population here. I was unable to make connections to get back to Iowa on Sunday, the 8th so I drove down to the southwest corner of the United States to look for the Magpie-jays. I missed the turn and drove on to Border Field State Park near Tijuana, Mexico, but on the U.S. side. The gate was closed, but I met a fellow who was planning to hike up to the end of the trail, so we hiked it together. 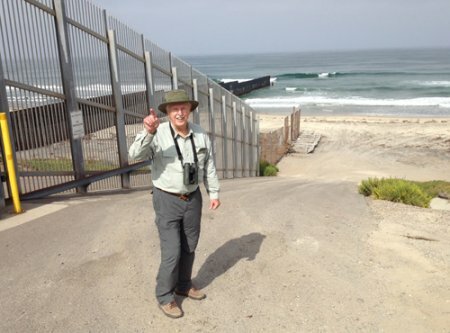 He took my picture by the fence between the U.S. and Mexico. I walked back to my car and found the Bird and Butterfly Garden where, later in the day, I had the pleasure of observing a flock of 5 or 6 of the Long-tailed Magpie-jays. I took some pictures on my phone, but none of them turned out very well. I was in Nome June 2-4 trying to get a good look at one of my 8 remaining unseen ABA Code 2 birds, the lovely Bluethroat. Bluethroats are found primarily in Asia and Europe, but western Alaska sees a fair number of breeders there during the brief spring and summer. I have seen Bluethroats in India, but never in North America. Two prior visits to Nome late in June had failed to produce a view, although other birds were plentiful. This trip was a success, producing number 730 for my North American count. Nome in early June, at least this early June, was crowded with birders and fisheries people, who were having their annual convention there. I was lucky to find a vehicle to rent and a room to stay in. (Phone calls a few days before my arrival indicated everything was taken). A local tour guide, Richard Benville, whom I have worked with in the past when I was in Nome, was extremely helpful on both counts, and with his help I was able to rent an F-150 and drive where I wished, and to sleep in nice quarters, one night at the Nugget and one night at the relatively new Dredge 7. My top priority, of course, was to see Bluethroats. On the morning of the third I started driving the Kougarok road. The weather was cool and foggy. At mile 22.8, I spotted a Bluethroat male, perching up on a small bush and was able to scope it for a few seconds before it dove into the underbrush. Soon it flew up, accompanied by what I believe was a female Bluethroat, and displayed briefly in the air before again disappearing. Continuing along the road, just before the bridge over the Grand Central River, my luck improved even more when a Bluethroat male made its way along the edge of the road, and was most cooperative in staying visible for quite a long time. The bird is even more beautiful than the pictures that I have seen would have led me to believe. I did not take pictures, but anyone wishing to see pictures of Bluethroats can do so by Googling “Bluethroat” and going to Wikipedia, which also contains a nice summary of its ornithological status.